When it comes to getting from point A to B, most people prefer four wheels over two. But for 65-year old Curt Cryer, bicycles are his preferred form of travel, and he’ll pedal his way about anywhere if he has the opportunity. Like many of us, Curt, a senior engineer in Distribution Planning, started riding a bike as a child. A few years later, he was using his bike to make money, pedaling and throwing newspapers in his Houston neighborhood. Today, Curt uses his wheels to get to and from work, when his schedule and the weather allow. Whether you’re eight years old or middle-aged, “if you need to go someplace, a bike is mobility,” Curt believes. As Curt got older, it wasn’t always easy for him to find time to ride. But 14 years ago while living in Oregon, his cousin challenged him with a 500-mile trek through the mountains. 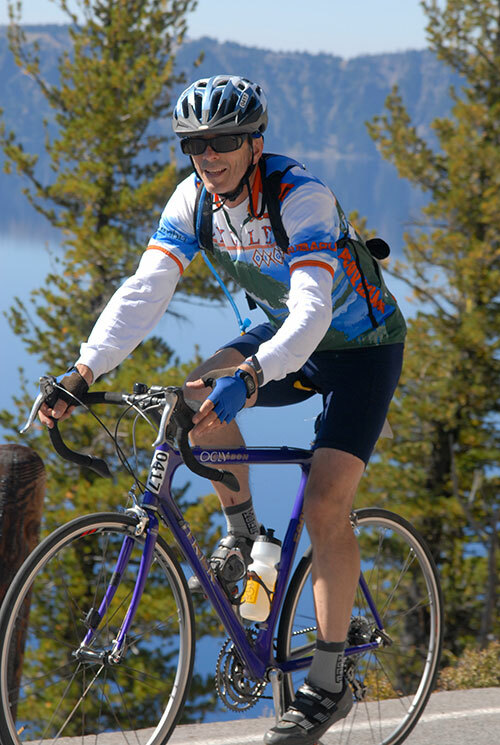 Curt borrowed a better bike and cycling shoes, and began the uphill battle of training for Cycle Oregon. He soon was riding nearly 100 miles a week to prepare for the week-long ride. “I had the desire to finish without hurting. Fear was part of it – going almost 500 miles in the mountains was a great motivator,” he remembers. When it came to cycling, he never looked back (except to check for oncoming traffic). Since then, he and a cousin have completed Cycle Oregon nine times. Cryer has cycled many times through the Great Northwest and other challenging areas. Curt loves to ride the Great Northwest. Last year, he and his cousin took a six-day excursion up and down the Oregon coast – 350 miles – for the pure joy of cycling. Next month, he plans to participate in the 360-mile Ride Idaho for a third time and one day he hopes to ride through Montana. Back home, Curt has logged many miles across San Antonio and the Hill Country on weekend rides or with Team CPS Energy at Bike MS: Valero Ride to the River, Fiesta Wildflower Ride and Tour De Gruene. “Pops” as many of his younger, fellow riders call him, believes cycling has been a key to his good health. He also lifts weights and does CrossFit to stay in shape. Cycling is in Curt’s blood and he likes to share his passion. When his kids were in Boy Scouts, he started a cycling merit badge. Today, he often sends out an email newsletter to coworkers and others to spark an interest in cycling. If you’d like to join Curt for a ride, let him know. And, don’t worry about the South Texas heat either.